Facing up to her critics! Stacey Dash&apos;s Oscars 2016 cameo during Chris Rock&apos;s hosting duties on Sunday, February 28, at the 88th Academy Awards, didn&apos;t go down too well. The actress&apos; onstage appearance at L.A.&apos;s Dolby Theatre left the audience in silence as she said to the crowd, “I cannot wait to help my people out. Happy Black History Month!” The joke appeared to be referencing her recent comments about eliminating Black History Month and the BET Awards. But rather than running away from the awkward moment, Dash, 49, took to her blog to address the performance as soon as she came off stage. And squaring up to her critics, the Clueless actress recorded her own version of Jimmy Kimmel&apos;s famous "Mean Tweets" segment to showcase the abuse she was receiving on social media. "I just walked off stage from the Oscars where I got no applause, no boos, people were, I think, awestruck, which was a little disappointing," Dash says to camera in her video clip, where she can be seen still wearing her sparkling Oscar gown. "But you know, I did it because I wanted to … Chris asked me to do it, and I love him and I support him. And I also think I should be the head of diversity for the Oscars," she said. After I got off the stage last night at the #Oscars, I thought I&apos;d let you have a peak into my Twitter feed. "But the backlash of that was I got a bunch of mean tweets and I thought it would be a really good idea to read them to all of you so you can see what I face." "You sucked on the Oscars like you do on Fox News. Pointless," one Twitter user wrote. "Nobody likes you," blasted another. But Dash appeared to be immune to the nastiness. "There are a lot of people who don&apos;t agree with me and have a lot of very mean things to say, which I will never live down, but here&apos;s the thing," she said at the end of her clip. "I do what I do because I want to do it, because I believe in it, it has nothing to do with race … I believe we are all equal. You should stop feeling that way too, that&apos;s my suggestion. I don&apos;t feel inferior, nor do I feel superior. I&apos;m very happy about what I did, and I&apos;m proud of it." 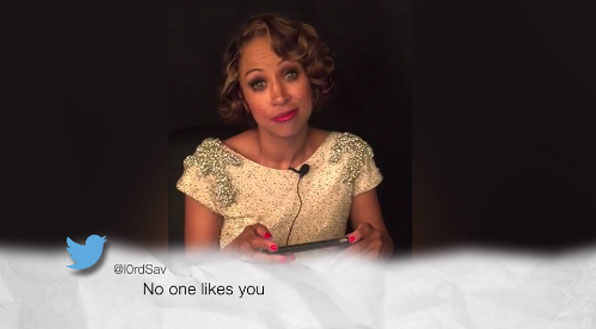 Check out Stacey&apos;s mean tweets in the video above.